With Spring just around the corner, this is probably a good time to revisit "feeding worms". I get a lot of questions related to worm food, so it's a common problem. Plus, everyone wants to grow bigger, fatter worms and no one wants their worms to grow sickly and die due to improper feeding. For review, here is a link to a listing of several posts on this blog related to worm feeding that you can review- what to feed, how to feed, and what NOT to feed. Basically, any organic material that hasn't been tainted with anything poisonous substances, that is suitably rendered for ease of eating (ground and/or partially decomposed), and that is moist but not soggy. 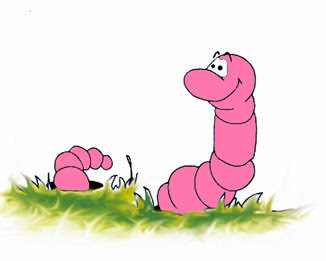 There are some foods you should avoid putting in your worm beds, such as potatoes, onions, meats, dog/cat feces. This post these and other foods to avoid feed worms (click for link). It is wise to take note, since you risk killing or sickening your worms by feeding them. There are of course commercially prepared worm feeds such as "FRM Cricket and Worm Feed", If you have access to manures (horse, cow, rabbit, goat) and other organic material, it shouldn't be necessary to purchase these foods, or only use them for fattening up your worms to bait size. 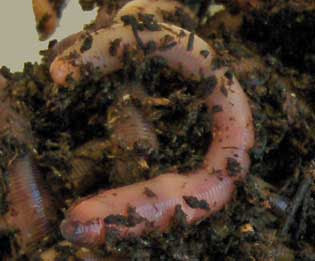 Worm feeding is fundamentally important to successful worm farming. And you should never stop learning about. 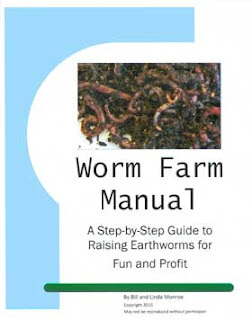 For information and answers to your worm feeding questions, click here for a preview of my worm farming manual. Why Aren't My Worms Breeding? Perhaps one of the biggest concerns new worm growers have is worm reproduction. Which makes sense. If your worms aren't making babies, you worm business isn't growing. You don't see any worms coupled together, mating. You don't see any egg capsules. Look for the small, rice-like shaped egg capsules throughout your worm bedding. They generally are more prevalent during the warmer months. You don't see any tiny thread-like hatchlings. If you do, treat them gently whenever you are into your worm bedding. The bedding is unhealthy: Too wet, too dry, too acid, too alkaline, needs changing out. It's too cold. When temps fall below 60 degrees, earthworms go dormant and will not breed. If you can keep your worms in climate controlled housing, you'll keep your worms breeding all year. Otherwise, the winter months will be down-time. The worms aren't happy for other reasons: It's too noisy, for instance. Keep an eye out for the breeding activity your worms and the egg production rate so you can rectify any of the above conditions that are in your control. New worm production is the life's blood of any worm farm business. For information on how to solve your worm breeding problems, click here for a preview of my worm farming manual. You'll find more worm reproduction tips and how-to's, as well as all aspects of worm farming, in my "Worm Farm Manual". Available in both download and hard-copy versions.